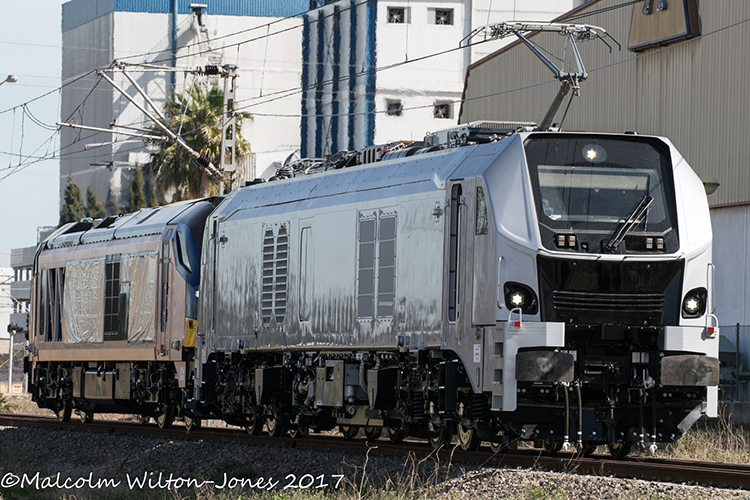 In March 2017, Stadler Rail Valencia announced that it had found a first customer for its new EURO DUAL bi-mode locomotives in Germany's HVLE. The deal covered the supply of 10 locomotives equipped for 15+25 kV AC overhead power with a power output of 5.2 MW in electric mode and 2.8 MW in diesel mode. At the same time, a prototype locomotive was completed, equipped for electric operations under 1.5 kV DC and 25 kV AC overhead power systems. Under 25 kV AC, the loco has a power output of 7 MW. Under 1.5 kV DC, the maximum power output is 4 MW. The on-board Caterpillar C175-16 diesel engine has a power rating of 3 MW and can be used as a booster to increase total power output to 9 MW. In May 2017, the loco was sent to Railway Testing Center Făurei in Romania for dynamic tests on the center's test ring. In general, the EURO DUAL is available for speeds up to 160 km/h, with a maximum electric power output of 9 MW and a maximum diesel power ouput of 3 MW.